The Facebook vs Instagram debate has raged on for a long time. Which one is better for growing your business? Which one should you devote your time and energy into? And which one gets better results? So many beauty business owners have asked themselves these exact questions, so I wanted to weigh in with a new perspective. 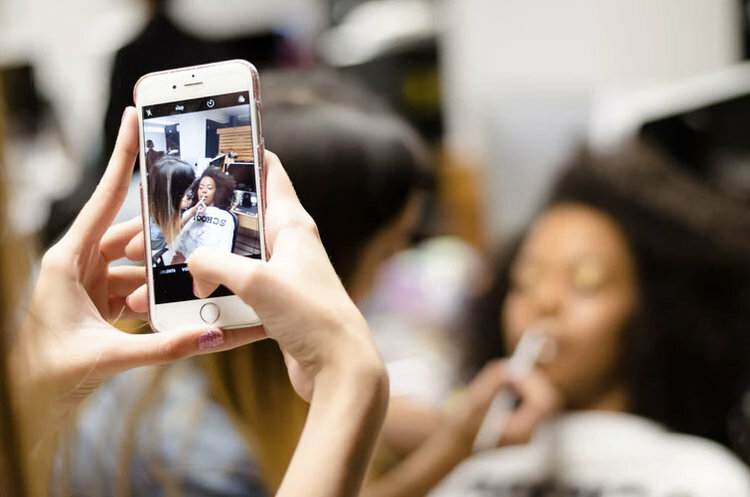 Many salon owners simply feel more comfortable on Instagram because that’s what they tend to use more often in their personal lives, especially the younger generation under 35-40. Also, many business owners who target a younger crowd believe that their audience spends more time on Instagram and so they tend to ignore Facebook. Because of this, I’ve seen countless Facebook accounts that are clearly being auto-posted from Instagram. You can tell because they post primarily square photos and they keep their captions and line breaker periods in there. But if you treat your Facebook exactly like you treat Instagram, you’re destined to get less engagement and action from it. It’s almost a self-fulfilling prophesy. On the other hand, if you give your Facebook page the attention it deserves and treat it like a separate platform from Instagram which has its own special benefits, features, and privileges, you’ll get at least twice the amount of promotional-goodness from it. You’ll gather more bookings, more clients, and more revenue than if you use Instagram alone (or just treat Facebook as a clone of Instagram and autopost all your content). Facebook has some amazing features that will help attract clients, keep them loyal, and create a community in ways that Instagram simply can’t. But if you treat Facebook exactly like Instagram, you’re missing out on promoting your business in a whole new way. It’s not that I have anything against Instagram. In fact, I think Instagram is absolutely crucial for any salon. It’s a visual and branding wonderland. Instagram is perfect for displaying a portfolio of your work, for sharing photos of you and your staff, and for sharing “off the cuff” short videos in your Instagram stories. However, it tends to be a longer-term “branding” platform. It’s great for getting lots of engagement and keeping your salon in the minds of your clients. Don’t get me wrong, you DEFINITELY need an Instagram account. When it comes to ACTION however - meaning clients taking action to book an appointment, for example - I believe that Facebook can often be superior. Facebook also has some super useful tools for engaging with your audience and attracting new clients that Instagram simply doesn’t have. 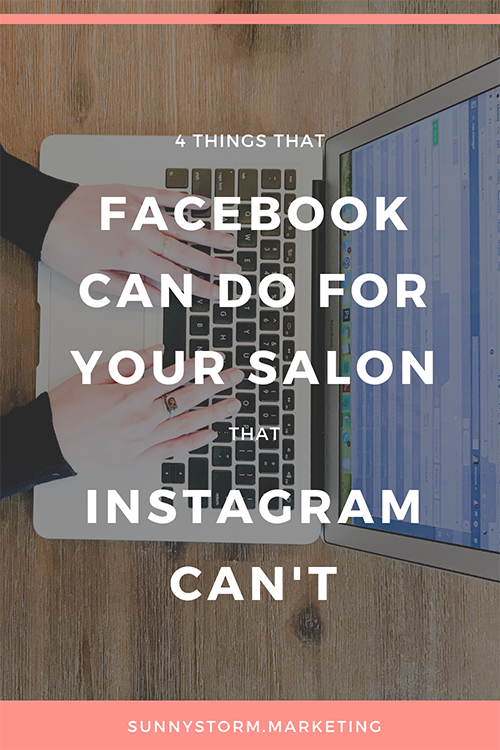 Here are four things that Facebook can do for your salon that Instagram can’t. As you’ve probably seen, people tend to have a shorter attention span on Instagram. They’re “scroll-happy” and will only look at posts for a few seconds, engage with them (like or comment) and then move on. That increased engagement is what businesses love about Instagram. However, if you want to create longer educational videos and you want them to lead to action, Facebook is 100% the way to go. In fact, studies show that your audience will spend twice as long watching your Facebook videos as they do watching your Instagram videos (source). When I say “longer” videos, I don’t mean that you necessarily have to have 30 minutes of video. But creating an educational video about your salon services and sharing your expertise is so critical to selling those same services. Even 5 minutes of video can help people to truly understand what it is you’re offering, why it’s important, and how it works. If you do microblading, a 5 minute educational video about what microblading is, the process, healing time, touch ups etc is incredibly valuable. It’s the type of service people need to really understand well before investing in. If you do hair extensions, a video going through the different types of extensions available, why there is a cost difference, how long it takes, etc. For spray tanners, creating a several minute video talking about after-care to extend the life of your tan could be so useful. The longer the tan lasts, the happier the customer and the more likely they’ll rebook. If you’re a hairdresser, create a video talking about why professional salon products are so superior to drugstore products. This will be an eye-opening video for your followers that can lead to more retail sales. Facebook is the perfect format for these, because it’s a platform where people spend more time focussing on videos, instead of just scrolling past and only seeing the first 4 seconds. And if you want to be sure that as many people see your videos as possible? Do them live! I know, it’s not easy to find the guts to do live videos. But once you get past that first live experience (stage fright, am I right?) you will LOVE doing them and you will see amazing results. Live videos get much better organic reach on Facebook than any other type of post, which is important for those of us who see that fewer and fewer of our fans are getting our posts (usually less than 10%!). So, once you’ve made this amazing educational video about your salon services, how can you use it to get your audience to take action? Along with the video, be sure to include a call to action - meaning a description and a link or “action” your audience should take. This could be a link to your website to book a consultation, a button where they can message your page to schedule an appointment, or a link to your website where you describe the service in more detail. Again, the great thing about Facebook is that it encourages ACTION. With Instagram, not only are people watching LESS of your video, so they don’t get the great educational value you’re sharing - you are also restricted in the actions that follows can take from your posts. The most you can say is “click the link in my bio”. With Facebook, you have many more options for getting people to take actions which lead to more revenue for you. Groups are one of the fastest-growing places on Facebook. In fact, within the past year, Facebook groups have grown 40% (source) and quickly become one of the best reasons to log in. 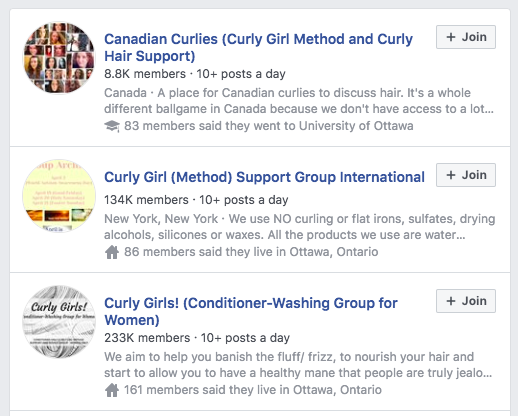 It seems like everyone is part of a Facebook group nowadays - they focus on everything from healthy food recipes, to military wives, to groups exclusively for those with curly-hair. I know from personal experience that the content I publish in my Facebook group gets more than twice the amount of engagement compared to the content I post on my business page. We join groups because we really do want to share, ask questions, learn, and engage with content. And if you do it right, a Facebook group can be HUGE for creating a community around your business. Unfortunately, groups are something that Instagram just doesn’t have. So, what you’re probably wondering is this: What’s the difference between my Facebook page and a Facebook group? What kind of different content should I put in one vs another? You’re asking exactly the right question. Because the type of content you should share in a group is completely different from the content you share on your business page. Your Facebook page can be full of photos of your work, pictures of your staff, promotional posts, “open appointments”, sales, and more. All of that is normal and expected. Instead, you need to think of a Facebook group as something completely different. People don’t join groups to be promoted to. They join in order to share, learn, and interact around a “theme” - not a business. People don’t join groups to be promoted to. They join in order to share, learn, and interact around a “theme” - not a business. So, if your salon specializes in curly hair, having a group about “curly haired girls” with ideas, tips, rants, etc all for people who have curly hair? Perfect! Promoting your hair cuts in that group? Not so perfect. Or, if you’re a skincare spa, a group around the theme of “natural, organic skincare” would be perfect. Members can share their favourite products, night time skin routines, questions about problem skin, etc. As long as you can be a voice of helpful, valuable, information in your group focussed around a theme that everyone in the group has in common? You’re doing great. Remember to be helpful and encourage discussions by asking questions and getting feedback whenever you can. The conversion shouldn’t be one-sided. Reviews are a hugely overlooked part of Facebook, but I can’t tell you how important they are! You can think of your Facebook page as the storefront of your business. Visitors can see where you’re located, they can take a look inside of your business through the window (on Facebook, by looking at photos of your salon), they can see the quality of your work and your skill level, AND they can also see a line up of clients who love your salon and would recommend you in a heartbeat. Where can they find this? In your Facebook recommendations! When potential clients are researching your salon - whether they had a friend recommend you, if they found you through a Google search, or if they saw one of your ads - one of the first things they’ll do is check out your Facebook page. One of the biggest reasons to do this is to read your reviews/recommendations. A salon with only a handful of lukewarm reviews will have a hard time competing with a salon that has 150 five star reviews. That’s because what other people say about you is just as important as what you say about yourself. Often, people will want to read your negative reviews, too. And trust me, if you’re around long enough, you will likely get a negative review from a disgruntled client. But it doesn’t have to be a devastating experience. Because if you handle your bad reviews right, you can actually win over new customers. If you handle your bad reviews right, you can actually win over new customers. They want to make sure that you’re polite, responsive, and that you try your best to please customers. They know that you can’t satisfy everyone, but how you respond to those negative reviews says a lot about you as a business. Don’t underestimate how important your Facebook recommendations are, and try to put in a place a plan for getting more of them on a regular basis. This brings me to the final, very important tool that Facebook gives your business which Instagram does not. Facebook gives you the power to encourage action in every single one of your posts. You can include links, “click to message” buttons, you can bring people to your website, or you can collect their contact information. On Instagram, you have one single place to turn your posts into appointments: The link in your bio. Instead, on Facebook, people are more “used” to taking action on a post instead of just liking and commenting. That’s what I love about Facebook. And it’s ESPECIALLY what I love about advertising on Facebook. I’ve tested this time and time again with beauty businesses. When we run an ad with a salon promotion, and we run it on both Facebook and Instagram, the Facebook post will always get better results. We’ll get more clicks to the website, more messages to book an appointment, and ultimately, more revenue. As I said at the beginning, I truly do believe that Instagram is crucial for any beauty business. However, Facebook should be treated differently. The type of content that you post needs to be different in order to get the most engagement. The tools that you use to create a community and nurture your audience are different, too. When you use it right, Facebook is an incredibly powerful platform for attracting clients and growing your business. But what exactly should I post on Facebook to get action and attract clients? Next week, on April 3rd, I’m hosting a free Masterclass where I’ll teach you 4 secrets to creating irresistible Facebook posts that you can actually track to bring in clients. If you’re ready to finally turn likes and comments into bookings and revenues, I invite you to join me on this training! You can click here to grab your seat on the workshop while it’s still available.